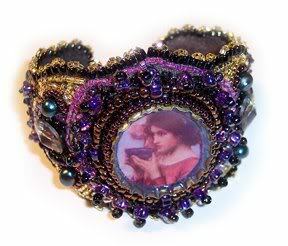 I have been admiring bead embroidery for a long time. You all make wonderful jewelry with this technique and so far I have been just saying that it’s something I would never ever try. Never say never, that is more than true in my case, it looks like. 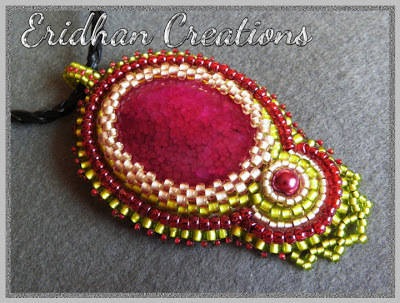 Making a beaded bezel for a cabochon is a lot easier than you might think it is. If you know how to do bead-weaving stitches like herringbone stitch, right-angle weave, and peyote stitch, you can make cabochon settings out of seed beads that rival even the finest metal cabochon bezels. The most asked question is, “How do I layer my flatwork pieces?” Well I have been doing this technique for over 20 years. 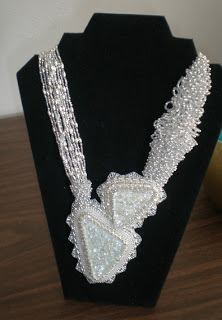 I have had this technique published in several magazines and in my own book, “FlatWork” I have kits that show the technique and I teach this in my beading classes. The process I use is so easy.